Hard hats are made to protect the heads of people to debris, and other hard objects, especially those who work in a hazardous environment. 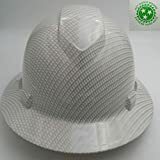 Carbon fiber hard hats are more expensive than regular hard hats because of the materials being used, and it is tougher, lighter, and more durable compared to the regular ones. Since they are made to protect someone’s head, you can expect that these things won’t break easily, not even a scratch or dent. If you are seeking for the carbon fiber hard hats, here is our list of best carbon fiber hard hats to help you look the best one for you. The hard hat has a ratchet headgear and has a fully adjustable swing. The headgear can fit a hat size of 6 3/4 up to 8. When it comes to the padded rear area of the ratchet headgear, it is nice to touch and has a replaceable super soft front sweatband. The headgear is fully adjustable from front to back, up and down and with two different positions. The hard hat is also hydro dipped, so you can assure that no one will get the same hard hat print as yours since hydro dipped are like fingerprints. They also use a direct bond to the plastic application, and that means there is no chance of having a print lifting off in any of the hats they are selling. It is not scratch less, but that does not mean that the print will come off. The black and shiny graphite pattern adds elegance to the look of the hard hat. Made from Abs material that provides ultra-light and strong protection, you can assure that this can secure your head while working. The low profile design of the HP44117S offers low center gravity for a better balance while wearing, and a four-position harness points that allow you to move the harness forward and backward, and up and down. When it comes to comfort when wearing, the rear-padded suspension gives additional comfort on the neck of the wearer. The vented pressure pad is keeping the straps in one place that gives additional comfort to the user. A replaceable sweatband padded fabric and PU foam for all-day wear is one of the features of this helmet. When it comes to the price, it is cheaper for carbon fiber hard hats. This DAX natural tan color helmet is designed by race-inspired technology. It comes with a hat tote to keep and secure the hard hat when not in use. The class of the hard hat is Class C, meaning it does not offer electrical protection. It comes with a rim grip on every side that helps to keep it clean and add some extra grip. The hard carbon fiber hard hat comes with 6-point ratchet suspension and can for to head sizes 7 to 7 7/8. In addition, it has a soft padded top and constructed with fiberglass material. If you are looking for toughness and comfort at the same time, you may consider looking at this carbon fiber hard hat. 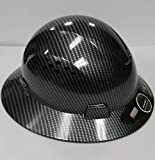 With a graphite pattern and shiny black color, this hard hat is constructed with ABS thermoplastic resin, ultra lightweight and meets ANSI 1-2009 standards type 1 class C, E, and G. The adjustable ratchet suspension allows the person to modify the fit while wearing it. The hard hat has suspensions, replaceable bro pad, and headbands. The 4-point suspensions can convert into a 6-point suspension with an HP6PTSUS. The four adjustable harness points suspension allows you to adjust the harness forward and backward, and up and down. The ridgeline allows a more comfortable, natural and secure fit. This carbon fiber hard hat is made from high-density polyethylene and a type 1 class C hard hat. It has a fast track ratchet suspension style for easy and fast adjustment. It has holes on top for cool airflow, and the full brim hat style keeps the rain off the wearer’s back of the neck. This hard hat can fit from 20.47 inches- 24.8 inches and weighs 1.49 pounds. The sweatband is made of fabric that is why you can rewash it, for hygienic purposes; in addition, it has a chin strap to secure the hard hat staying in your head. Take note that this is class C, and it is not suitable for electric utility use. The 475395 is made with phenolic materials and not with the traditional plastic. It is designed to face a high-temperature environment and everyday usage. You can use this for Agriculture, Construction, Chemical, Electric Utility, Mining, Hazardous Materials, Nuclear, and many more. 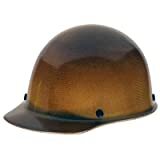 The helmet is tested to radiant heat loads that produce temperature up to 350F. Type 1 compliant that protects from impacts and penetration. ANSI Z89. 1-2014 Class G that gives dielectric penetrations up to 2,200V. The Fast-Trac III ratchet type suspension is for easy adjustment, and this hardhat carbon fiber hard hat can fit from 6 1/2 inches up to 8 inches. It is equipped with fast-trac ratchet-style suspension so you can easily adjust the helmet according to your need. Type 1, Class C it does not fit for electrical utility, but it is good protection since it is made from heavy-duty materials. 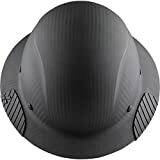 The holes at the top of the hat make your head breathe, and the full brim keeps the rain off the back of the neck of the user. Hydro dipped, meaning the design is unique and will not peel off the helmet. It weighs only 1lb meaning it is lightweight and the black color makes it more attractive. This DAX carbon fiber hard hat is matte black finished. Exclusively designed to give a secure feeling. The Clarino synthetic leather with molded EVA foam inserts to give an additional shock. The oversize ratchet fitment dial is designed for easy adjustment and gripping when gloves are on. Type 1 Class C, which means you can assure head protection from debris while working. The weight of the hat is only 17 ounces and made with carbon fibers. The hat comes with a rim grip on each side and each hard hat has a 6-point ratchet suspension and can fit to head sizes from 7 inches up to 7 7/8 inches. Our second best carbon fiber hard hat is the 475407 from MSA. All the hard hats from MSA are made from Phenolic materials, and not from plastic. It is type 1 compliant, which means it protects from the vertical impacts and penetration, and the Class G compliant gives protection up to 2,200V. The hard hat is equipped with the Fast-trac III ratchet-style suspension, so you can easily adjust the size of the suspension and for your all-day comfort as well. The package includes 1 pc of standard size carbon fiber hard hat. The standard size is 6 1/2 inches up to 8 inches. 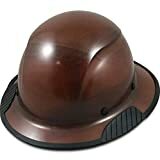 When it comes to safety, comfort, and the price you can try this hard hat from Pyramex Safety. Made from ABS material, which makes it strong and weightless. You can easily adjust the ratchet suspension to allow the user to modify the fit when wearing the helmet. Experience the ultimate toughness and comfort because the ridgeline helmet is a combination of high-performance protection from impacts and comfort at the same time. The 4-way adjustable harness points allow you to move the harness back and forth, and up and down that gives you the chance to perfectly fit the hard on your own comfort. This is a type 1, Class C, G, and E and that means that you can use it in the electric utility. Wearing a hard hat on work, especially if you are working in an environment that requires wearing this is important. We will never know what will happen in every day, and having protection such as this is very important. Works that usually requires wearing carbon fiber hard hats are mining, construction, electric utility, chemical, and many more. These best carbon fiber hard hats are tested to be the best. When Do You Need To Wear It?- Although hard hats are designed to protect, there are also categories of hard hats that you have to consider. There are 3 classes of hard hats based on the level of the protection that you need. Choose which one you need. Carbon Fiber- Carbon fibers are unlike conventional hard hats. It is lighter, stronger, and durable. It is also more comfortable to wear, and because of innovation, it is lighter compared to the old style of hard hats. When it comes to the price, it is expensive, although you can assure that this product can fully protect you because this type of hardhat cannot easily be cracked when a hard object hit it, and it is made to last long. ANSI Approved- Any hard hat must be ANSI approved. Select the appropriate type and class of helmet that you need to avoid having problems in the future. Type 1 is for top protecting and Type II is for the lateral. The safety of a person is what we are talking about here, and it is important that they wear proper safety helmets because they are risking their lives. 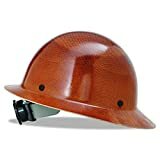 Suspension and Style- There are many styles of hard hats when it comes to the suspension of hard hats the popular ones are ratchet and pin lock. A ratchet suspension adjusts a ratchet at the back, while the pin lock adjusts it with pins and holes at the back of the hat. You have to consider which one is better for you. There are also vented and non-vented carbon fiber hard hats. A vented one is the one with small slots that encourage the air flow, while the non-vented has no slots. For people working outside, it is important to get the vented one because overheating is a serious thing that needed to be prevented. There are three classes of hard hats that are based on the level of protection that they provide from electrical hazards. Class C (Conductive)– It does not offer electrical protection. It only protects you from falling debris. Class E (Electrical)– It can protect you from electrics that rate up to 20,000V.